Happy first day of summer! Though this is the season for the ice cream truck (especially with a major heat wave on the way), it's also one of the best times of year to enjoy delicious fruits and veggies. We asked SELF contributing editors Stephanie Clarke and Willow Jarosh, registered dietitians and co-founders of C&J Nutrition, to recommend the freshest, tastiest produce available right now -- and tell us the best ways to serve it up. 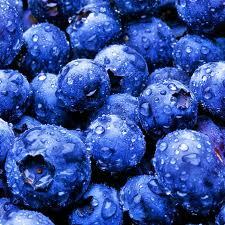 Blueberries - The purple-blue berries are loaded with phytonutrients and antioxidants. Anthocyanins are powerful antioxidants that give blueberries their color, and they also contain the antioxidant chlorogenic acid. The powerful antioxidant combo is what makes scientists particularly interested in blueberries for their potential brain benefits. How to eat them: Toss a handful of blueberries into a salad and drizzle with olive oil and vinegar -- their flavor pairs really nicely with greens. Or, freeze blueberries and drop them into lemonade as fruity ice cubes! Apricots - These summery fruits are loaded with vitamin A (55 percent of the recommended daily value per three apricots) and vitamin C (20 percent recommended daily value per three). They also contain potassium, which can help offset some sodium intake. How to eat them: Cut in half, remove pit, and either grill or broil until tender and golden. Then serve over vanilla yogurt or pair with grilled chicken, fish, or lean cuts of pork or beef. Or slice them raw into a spinach salad (the vitamin C will help your body absorb more of the iron in the spinach). Watermelon - The name says it all: this fruit is PACKED with water. So, noshing on this does double duty -- it provides nutrients like vitamins A and C, along with powerful phytonutrients like lycopene, and it also helps you stay hydrated on hot days. One cup of melon cubes delivers only 46 calories. How to eat it: Try tossing watermelon cubes with fresh coconut and then drizzle with hot sauce -- it's a traditional (and delicious) flavor combination in Mexico. Or blend watermelon with a couple sprigs of mint to make a cooling summer beverage. Zucchini - This versatile summer veggie contains vitamin C and several of the B vitamins, which help your body use the foods you eat for energy. Tomatoes - A medium tomato provides 40 percent of the recommended daily value of vitamin C and 10 percent the daily value of potassium. And tomatoes get their red color from lycopene -- a potent antioxidant. How to eat them: Enjoy tomatoes with a source of healthy fat (like olive oil, nuts or avocado) and you absorb up to 10 times more lycopene. Tomato-cucumber salad is a simple side dish that's always a hit. Dice tomatoes (remove seeds) and cucumbers and toss with a pinch of salt and pepper and a drizzle of olive oil and balsamic vinegar. Toss and serve as a fresh summer salad. Basil - Basil contains powerful phytonutrients known as flavonoids, which provide protective antioxidant benefits. Some of the antioxidant benefits are being studied as potential protection against certain types of cancers. Basil also contains vitamin K, a nutrient that is important for proper blood clotting as well as bone health. Plus, using herbs to flavor your foods means you're adding loads of flavor without overdoing it on calories and sodium! How to eat it: Toss whole basil leaves in with a salad mix to add fresh, fun flavor notes. Tear basil up and sprinkle over grilled fruit with a drizzle of honey or maple syrup as a summery dessert.